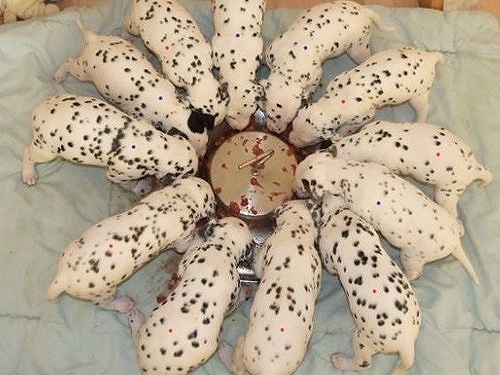 Dalmatian 101 section on this website. 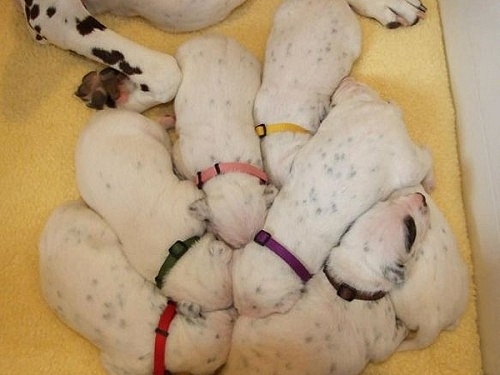 We take a lot of pride and care in planning, breeding and raising a litter of Dalmatian Puppies here at Caprilli. Breeding Dalmatian Puppies is not about creating Puppies for adoption but to keep this ancient breed and hopefully better it over time. For this reason we utilize bloodlines from all across the western world. 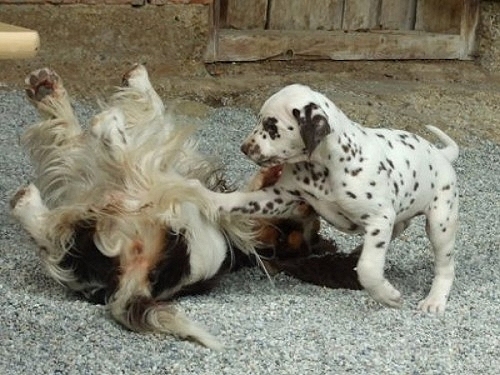 Some of our Dalmatian Puppies go on to become conformation or performance Champions, some are destined to carry on the blood lines and all of them are much loved Pets. Our Dogs are health tested and managed in a holistic and natural way. Over the years we have seen vast improvements in their overall health due to this commitment. Our Dalmatian Puppies have a wonderful and sweet disposition and are raised to have every possibility to turn into adorable members of families as well as modern society. 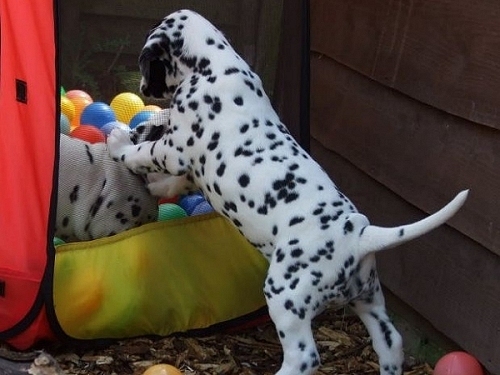 We need you to understand that we do our best to provide you with a healthy Dalmatian Puppy but that it takes your efforts as well as ours to continue our work by providing the correct management for your Dalmatian Puppy. Our next litter of Dalmatian puppies is planned for July 2018. 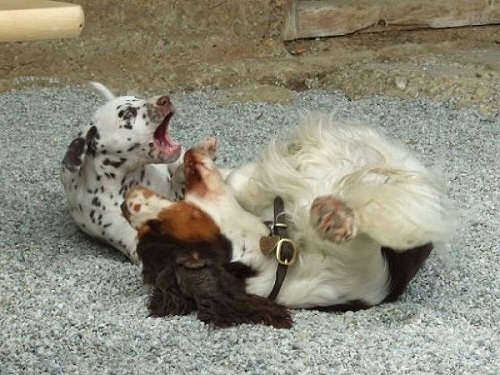 Please contact us via email sy(@)caprilli-dalmatians.com for a referral in the US. We have moved to Europe but are happy to forward your contact to a breeder known to us. We have plans for a litter in July of 2018 and potentially one more later in the year. Please read our Dalmatian 101, including all of its links, before filling in a puppy application form. We take a very natural approach in raising our Dalmatian puppies and will only accept families, who are willing to continue this journey. 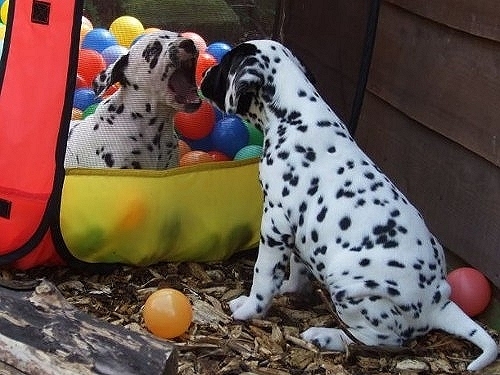 We are also always interested in hearing from you if you would be willing to co-own a Dalmatian Puppy with us. 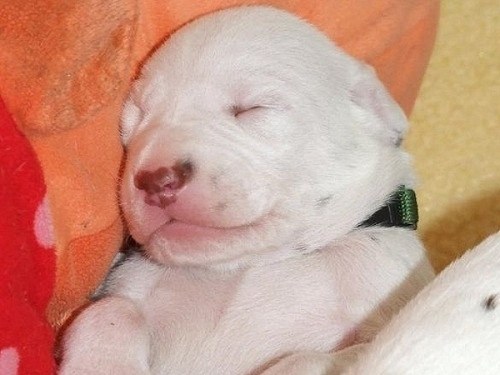 This could be a Dalmatian Puppy bred by us, or a possible import puppy from a reputable breeder of Dalmatian Puppies in Europe, well known to us. Please follow the links below to view detailed information of our previously bred litters. 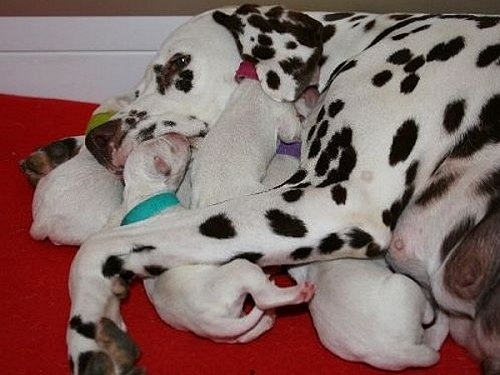 You will find the parents, their pedigree and many pictures of our Dalmatian Puppies. This is particulary interesting to follow as you can watch our Dalmatians grow - week by week. Since this question is always raised we created this section for you. The first steps in any Puppy Adoption at Caprilli Dalmatians is that we ask you to read our "About Us" as well as our "Dalmatian 101" section of this page. Both sections can be found on the main menu of this page. Those of you who live more local to us, we would like to read our co-owned section too. We would then ask you to fill in our Puppy Application form. These steps will then provide both you and us with a good bit of information about each other to take into a more personal conversation via telephone. If all these steps go well, I will be happy to include you on our waiting list to adopt a Caprilli Dalmatian Puppy. We need you to understand that Caprilli Dalmatians have travelled all across the Western World and can be found in eight different countries but we do not ship our puppies via Cargo to families, who we have not met personally. This means that wherever you live, you need to be prepared to come and collect your Dalmatian Puppy from our home. Puppies of eight weeks are allowed to fly with their owners inside the cabin of an Aircraft. They deal with flights as well as long car journeys very well and most families report that it was an excellent experience for their new family member. Our thoughts on how to best proceed with our breeding program have continuously developed from the early days. We never wanted more dogs at home than we could keep as pets, but at the same time we also never wanted to run the danger of breeding from what we had at home simply because it was there. This is when our current system of Co-ownership developed, and up to this day it assured that every Caprilli bred dog can enjoy a full pet life whilst at the same time providing a great choice that enables us to only breed from the very best that we have ever been able to breed. We owe a lot to our Co-owners, who over the years have always supported us and who made it possible to continuously breed Dalmatian puppies with the betterment of the breed in mind, no matter in which country we ended up living! In the olden days breeders used to own anything around 20 – 70 dogs that where part of a breeding program! It was simple, they kept the most promising puppies from each litter they bred, and sold the rest on to pet homes. They waited until the puppies would mature, and again, those that showed the least promise where passed on. They bred from those that were still standing when they came of age and those that did not produce the offspring that they should were passed on again. This hard and rigorous selection process assured that only the best went on to produce future generations. Thankfully for our dogs the attitude has changed a lot since then and mainly for the better. It is not acceptable to treat dogs as livestock today, but this trade for a better life made selective breeding very difficult, if not impossible. Today breeders have much more knowledge available to them since science has moved forward. We can health test, and modern forms of communication and education assures that we constantly have access to more and more information that could be utilized IF we still had the dogs to selectively breed from. We wanted to create this possibility without sacrificing a life with pets and without sacrificing the pet’s life that every puppy, we ever bred, deserves to live. For this purpose, we came up with our own Co-ownership plans. From each litter, we home the most promising puppies to pet owners who are prepared to Co-own with us. By far not all of these will be bred from. Only those that show the most potential in all aspects of a dog’s life will be destined to secure future generations at Caprilli Dalmatians. If you are interested in being part of the Caprilli Family or would like to find out exactly what it means to Co-own a Dalmatian with us, feel free to contact us by Telephone. The number can be found in the header of each page.